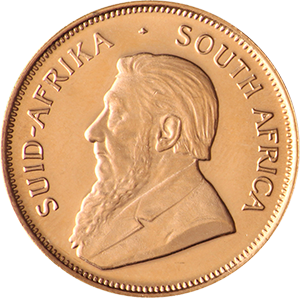 The 1/2 ounce Krugerrand is one of four standard denominations for the South African gold bullion coin. 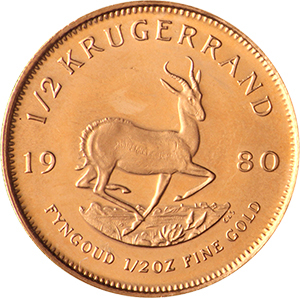 First introduced in the 1960s, by the beginning of the 1980s Krugerrand made up more than 90% of the entire global market in gold bullion coinage. This dominance in the market was hit by sanctions on the country and many of the world’s leading mints producing high quality bullion coinage from 1979 onwards. The 1/2 ounce Krugerrand has a diameter of 27.07mm and weighs 33.930g. This makes it the second largest of the four standard denominations, all but one of which (the original 1oz Krugerrand) were introduced in 1980. It has a reeded edge and a gold content of 22 carats, which makes it among the purest of gold bullion coins, with the exception of a handful of the most prestige mints, which produce purity of 24 carats. The coin’s design depicts the South African Springbok, a type of antelope and an iconic national symbol, the most recent of which was introduced in 1984 and designed by Coert Steynberg. Otto Schultz’s portrait of former Prime Minister, Paul Kruger (after whom the coin is named) was also first pressed in 1984. The Krugerrand has minted several special edition coins over its more than fifty-year history, most recently the 2017 50th anniversary coin. There are gold, silver and platinum versions of this edition. Another highly collectable release was the proof editions, all of which trade above the standard denominations. It is thought the collectability of such releases is what gives the coin its extra value. It is vital that these products are purchased from trusted sources. Goldinvetsments.co.uk are one of the oldest and most highly regarded vendors in the UK and we are happy to dispense expert advice from our London based office.